Basketball players still get posterized, but they're no longer getting put on iconic posters. Blake Griffin probably remembers every memorable dunk in his career. Timofey Mozgov. Pau Gasol. Kendrick Perkins. The Kia he jumped over to win the 2011 dunk contest. It’s a long list, but because those moments are played on endless loops during highlights, dunk compilations, GIFs, YouTube videos, and many other digital forms online, they’re hard to ignore, for Griffin or the average fan. Michael Wilbon is credited with the earliest use of the term, in a 1991 Washington Post article, when he described Sam Perkins getting out of the way of a Michael Jordan dunk to avoid being “posterized.” Nearly 30 years later, when a thunderous slam dunk happens in a game, like when LeBron James threw down arguably the best dunk of his career recently on Jusuf Nurkic, social media accounts still rush to proclaim that another player has been put on a poster. But they’re not actually being put on posters anymore. As the world has become more digital, the value of owning a permanent, physical item seems to matter less and less. We’ve seen this with music, where CDs have been replaced by streaming services. Just a decade ago, purchasing DVDs and Blu-rays was still a thing for collectors, and while they may persist today, every television show and movie is also just a click away. Neil Flagg is the founder, president, and CEO of Sports Poster Warehouse, which markets itself as "the world’s one-and-only sports poster specialty store." Flagg, a huge sports fan and sports poster fan growing up, launched his company in 1997. Flagg remembers the joy of hanging up posters of his favorite sports moments in his room growing up, including Paul Henderson’s series winning goal over the Soviet Union at the 1972 Summit Series, one of the most iconic moments in Canadian sports history. 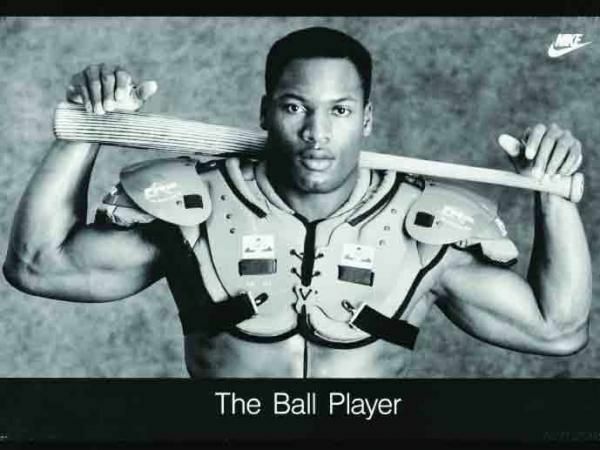 Michael Jordan’s “Wings” poster and Bo Jackson’s “The Ball Player” posters are among Flagg’s personal favorites. He also has an affinity toward Marketcom’s classic white-borders posters, which you could order from the back of Sports Illustrated magazines in the 1970s and 1980s. A lot of these vintage posters, which have been out of print for years, are still available on Flagg’s website, thanks to years of sourcing original posters from sporting goods stores that were shutting down and liquidating their inventory, or taking advantage of other opportunities to purchase vintage collections from sellers. Aside from his theory that posters are no longer a cultural event, Flagg pointed to the monopolization of the poster industry as something that has created little to no incentive for anyone to want to be creative with their poster designs. Today, posters—of sports and pop culture variety—are mostly produced by Trends International, a private company based out of Indianapolis. They’re the company that stocks posters at big-box stores like Walmart and Target. The market is no longer filled with individual people who can express themselves creatively. When it comes to creativity in the poster business, nobody did it better than John and Tock Costacos, two brothers from Seattle better known as the Costacos Brothers, who completely changed the rules of what a sports poster could be in the 1980s. The Costacos Brothers turned each poster they made of an individual player into an event. The posters came to define players. It accentuated their greatest traits and turned the players into larger-than-life icons. Mark McGwire and Jose Canseco were The Bash Brothers, dressed up in an homage to The Blues Brothers while holding giant bats. Brian Bosworth’s poster had the tagline "The Land of Boz," with a fully re-imagined Wizard of Oz cast surrounding him. When I reached out to John Costacos to speak with him about the sports poster industry, he had a quick-witted response as to why the creativity no longer exists. “Because we’re not making them,” Costacos told VICE Sports. For Costacos, it’s a chicken-or-egg question. He wonders if great sports posters aren’t being made anymore because kids are no longer buying them, or if kids aren’t buying posters because they’re no longer great. The Costacos Brothers sold their company in 1996, and faded from the sports poster industry as well. But they made a brief comeback in 2016, when they teamed up with Seattle Seahawks quarterback Russell Wilson for a throwback poster with Wilson in combat gear and the tagline "Armed and Dangeruss." The idea came to John when he was watching Wilson from his couch at home. He called up Wilson’s agent, ideas were bounced around, and eventually a photoshoot was set up. During the photoshoot, Wilson was energetic, and went the extra mile, even sending one of his assistants to go outside to collect some dirt, so it could be mixed into a bowl with water and oil to allow him to run it over his arms for extra effect. John got a kick out of seeing how well-versed Wilson was with the history of the Costacos Brothers posters. After the photoshoot, at a fundraiser for Wilson’s Why Not Foundation, two copies of the poster were auctioned off for $30,000 each. John’s favorite moment of the evening was when Wilson took a photo with Steve Largent and Bosworth, who held up their own Costacos Brothers posters, shot in 1986 and 1987, respectively. While John would love to make a return to the industry, he recognizes that times have changed. Today, players don’t need an iconic poster to help further their brand, not when social media is available for them to curate an image with their fans, with the assistance of a group of publicists who are meticulously trying to fine-tune every detail about the athletes they represent. And if that doesn’t work out, there’s always a chance to pen an essay on the Players’ Tribune. Ironically, there are more posters available now than ever, according to Flagg. There’s just a distinction between quantity versus quality. “It’s not a dying market,” he contends, although when most customers reach out, they’re not looking for the latest bland poster design of LeBron James; they’re trying to track down iconic posters from years ago. To this day, Flagg still gets calls about the availability of the Michael Jordan “Wings” poster. “There’s no growth in it,” Flagg said of the industry. “We haven’t had growth in ten years. The market is still there, but it’s not where it used to be.” In response, Flagg has shifted some of his business focuses toward selling fitness charts, a popular purchase for local gyms, and motivational posters, which is a bestseller as well. Would anything inspire John to make a permanent comeback in the sports posters industry? “If I could make a poster and it becomes a thing that the kids want on their wall, that’s what would motivate me,” he said. Today, though, it’s less likely that the kid growing up dreaming of being Griffin at the dunk contest will have that kind of wall. It’s more likely one of his famous posterizations will show up as their iPhone background, or Macbook screensaver. Or, they’ll just go online and pull up a dunk compilation on YouTube. “Times have changed,” Griffin said.